Acetylcholinesterase and donepezil drug complex. 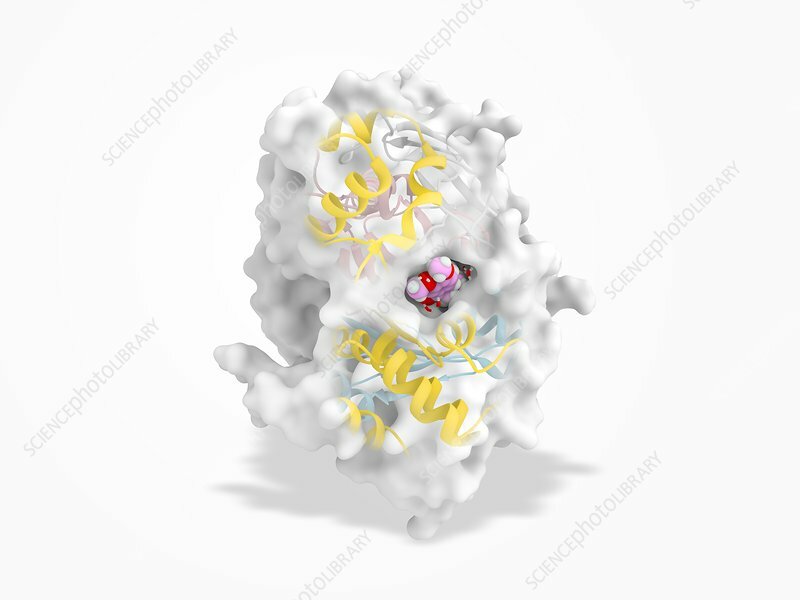 Computer illustration showing the structure of a molecule of acetylcholinesterase (AChE, white, yellow ribbons) in complex with a molecule of the Alzheimer's drug donepezil (Aricept, spheres, centre left). AChE is an enzyme responsible for hydrolysing acetylcholine and other choline esters that act as neurotransmitters in the brain. It is the target of some drugs, such as donepazil, to alleviate the symptoms of Alzheimer's disease and nerve gases used as chemical weapons.